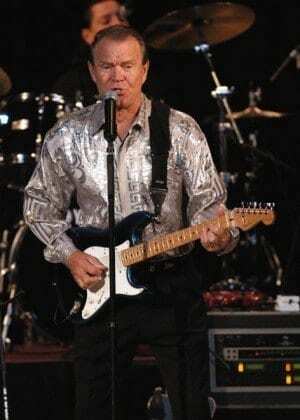 Glen Campbell was honored with a Lifetime Achievement Award at the 54th Annual Grammys last night. In June 2011, Campbell, who has suffered short-term memory loss for years, announced he had been diagnosed with Alzheimer’s disease. He released his final album “Ghost on the Canvas” last fall and is currently in the middle of his farewell tour after 50 years in the business. Country stars The Band Perry and Blake Shelton joined together in a tribute to Campbell at the Grammys. The sibling trio performed their rendition of “Gentle on my Mind” and Shelton sang a verse of “Southern Nights” before the country legend himself appeared onstage for his first live television performance since the diagnosis. Campbell and company sang “Rhinestone Cowboy,” Campbell’s first Number One Record and largest selling single. The 75-year-old singer’s voice was strong, but the effects of the disease were mildly apparent when he fumbled on some of the lyrics. The audience didn’t seem to mind. Everyone was on their feet – Lady Gaga was seen clapping along, while Joe Walsh and his wife Marjorie danced in the aisle and Paul McCartney fist pumped energetically. Campbell’s decision to keep performing after the Alzheimer’s diagnosis is unprecedented, says the Alzheimer’s Association. The singer is aided onstage with three teleprompters and is supported by his family. Three of his children have joined his current band, with sons Cal and Shannon on drums and guitar, while his daughter Ashley plays keyboard, banjo and violin. Campbell’s children strive to provide as much comfort and support as possible, “I just try to make him feel like he is surrounded by people that love him on stage,” Ashley told CNN.